The Neapolitan nativity scene represents a tradition with very ancient origins. 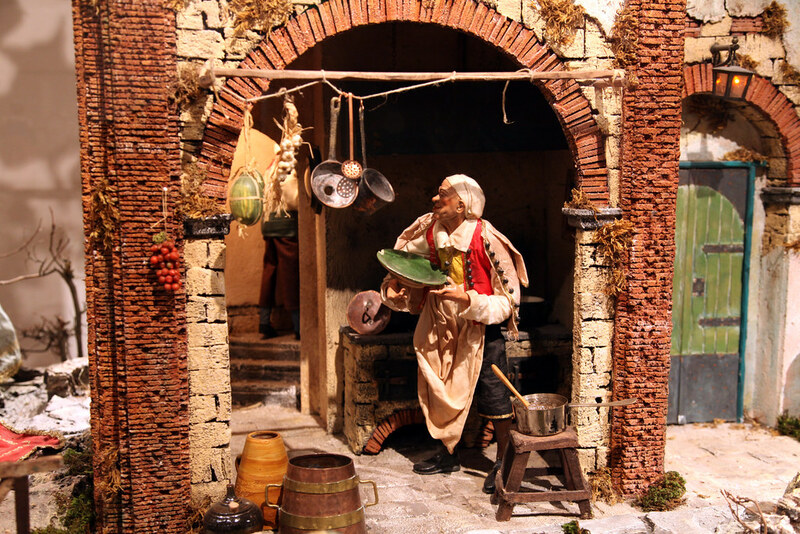 The first nativity scene installation in the Neapolitan city was set up by the Franciscan order in the fourteenth century. Initially the Nativity scene was conceived as a mere representation of the nativity, designed to underline the absolute poverty in which Jesus was born. Its diffusion was widespread. In the sixteenth century, the classical sacred figures were joined, by Gaetano da Thiene, by characters of the people. The novelty lay in the juxtaposition between the sacred and the profane. But it is only in the eighteenth century that the nativity art reaches its moment of maximum splendor thanks to the passion of King Charles III of Bourbon for craftsmanship. Everyone began to have a nativity scene in their homes: from the nobleman who flaunted his wealth to the humblest of Neapolitan citizens. The tradition of the nativity scene went on until a slow decline began around the nineteenth century. 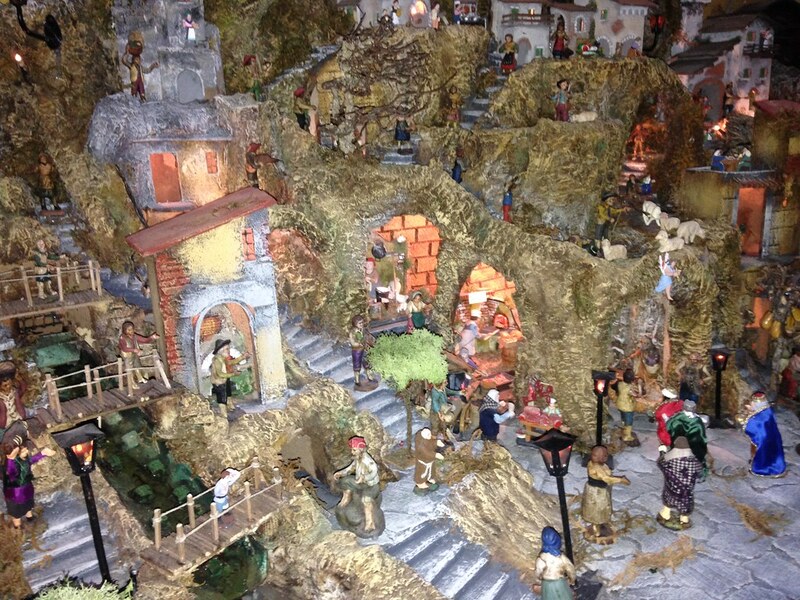 Despite this, it has reached the present day always fascinating and full of the commitment and passion of the nativity scene makers, as testified by the ancient district of San Gregorio Armeno. 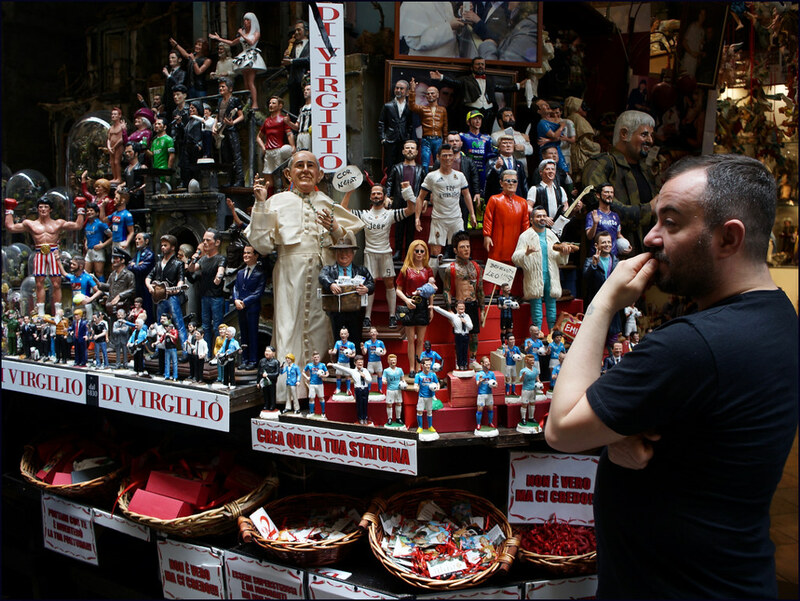 Home to one of the most ancient Neapolitan traditions, San Gregorio Armeno owes its world fame to its nativity scenes. The neighborhood is a riot of colors 365 days a year. Walking through the alleys of the historic center it is not difficult to get lost among the many artisan shops, admiring the long and meticulous work behind every statue and structure. The smell of roast chestnuts invades every corner, even the most hidden one. Sellers and restaurateurs give huge smiles. The magic of Christmas envelops everything, creating a unique and engaging scenario. 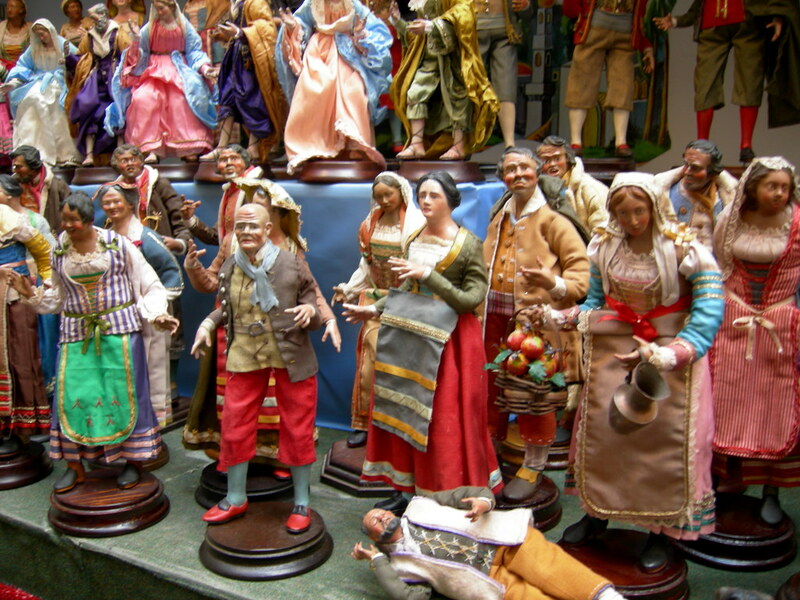 San Gregorio Armeno is happiness. The happiness of a child who roams in the shops of the master nativity scene and discovers a new world of art and tradition secular. The happiness of a family that, united, is preparing to celebrate Christmas. Happiness in the face and in the gaze of a person met in that instant and never again reviewed. Because - let's tell the truth - Naples will have a lot of flaws, but the friendliness and warmth of people is difficult to imitate. In the passage that came from the simple representation of the Nativity to the nativity scene as we conceive it today, there are many symbols that lead us back to the much more archaic pagan culture. merchants, who represent the individual months of the year. The butcher is associated with January, the cheese seller in February, the chicken seller in March, the egg seller in April, the cherry seller in May, the baker in June, the tomato seller in July, the seller of watermelons in August, the fig seller in September, the innkeeper in October, the chestnut seller in November and the fish seller in December. Next to the traditional shepherds you can also find the caricatures of the VIPs who during the year have distinguished themselves for their presence in the gossip world. Their caricatures make the stalls funny and colorful. 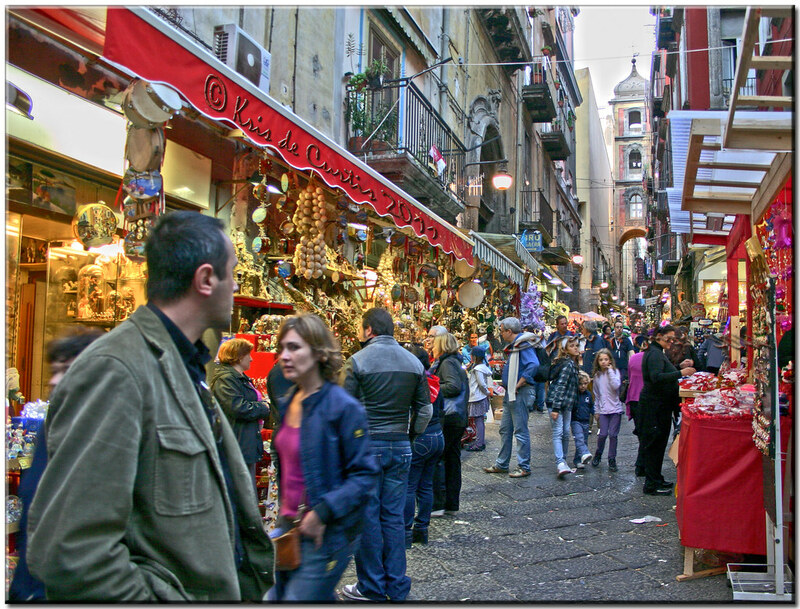 From Naples Central Station, cross Piazza Garibaldi and merge onto Corso Umberto I, which is better known as Rettifilo. Continue straight on this road. At the first roundabout - Piazza Nicola Amore - take Via Duomo, the first on the right. Continue to Via San Biagio dei Librai or Via dei Tribunali, streets perpendicular to Via San Gregorio Armeno. If you do not like walking, the alternative is to take the underground line 1. Get off at Piazza Dante and continue along Via Port'Alba up to Via dei Tribunali.